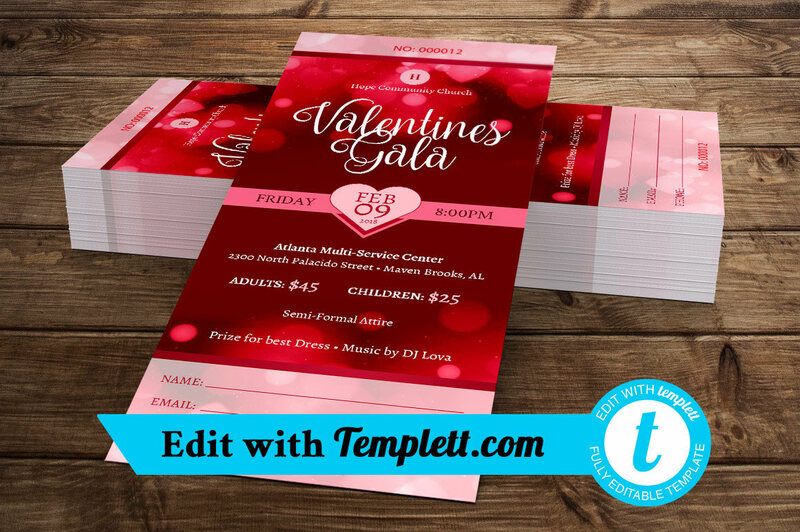 Valentines Gala Flyer and Ticket Templetts are for valentines fundraising events. perfect for churches and non-profit organizations. These template can be edited online, no program needed. Edit them in your browser on templett.com. Purchase them on Etsy and Edit on Templett.com. 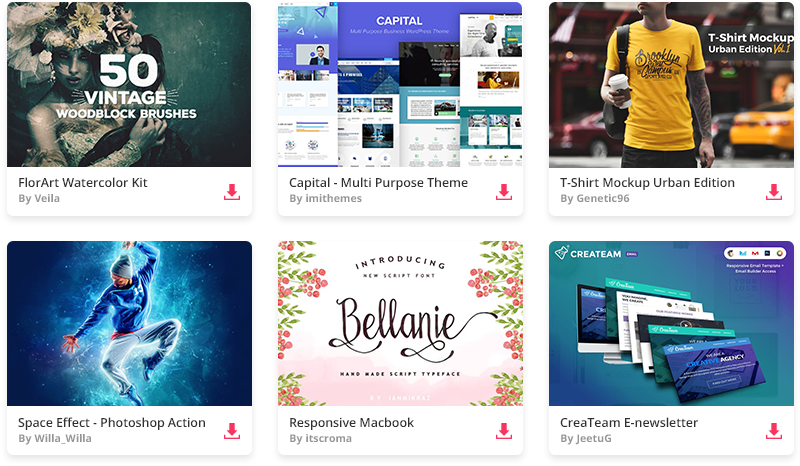 The Templett application is the very best way to edit printable templates and since Etsy is such a large marketplace of template sellers, you can now purchase your templates on Etsy and edit them with Templett. The Valentines templates in this list are TEMPLETT.COM templates designed by Godserv to be edited in your browser on TEMPLETT.COM. No other software is necessary. NOTE: There is no template to download from Etsy for this listing. Access and Edit the templett in your Web Browser on templett.com by Clicking the Access link. Download a format to be printed by Clicking the Download Button – Top Right. NOTE: Access to the template is for 60 months. 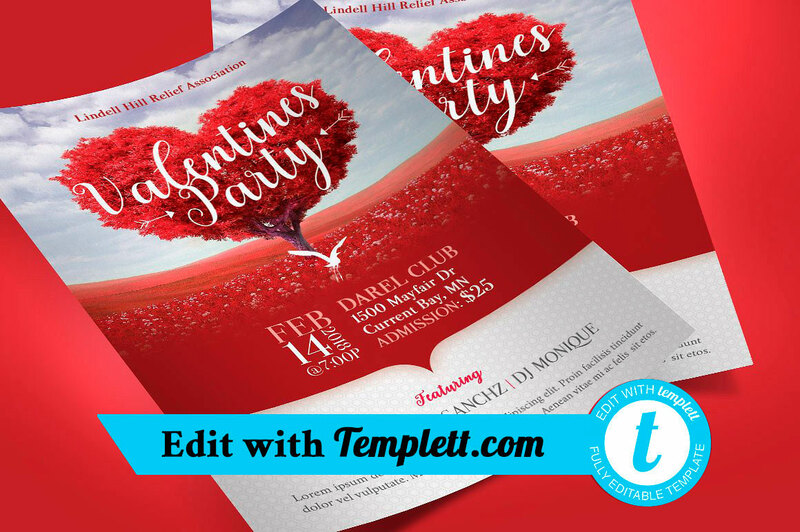 Tree Heart Party Flyer Templett is for valentines fundraising events. perfect for churches and non-profit organizations. The red heart background sprinkled with pink makes it perfect for your event. Tree Heart Valentines Party Ticket Templett is for valentines fundraising events. perfect for churches and non-profit organizations. The red heart background sprinkled with pink makes it perfect for Valentines. 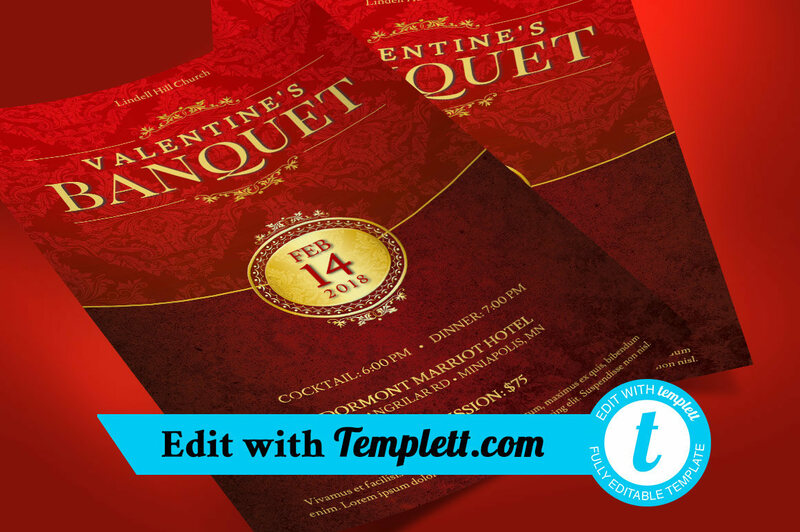 Valentines Gala Flyer Templett is for valentines fundraising events. perfect for churches and non-profit organizations. The red heart background sprinkled with pink makes it perfect for Valentines. 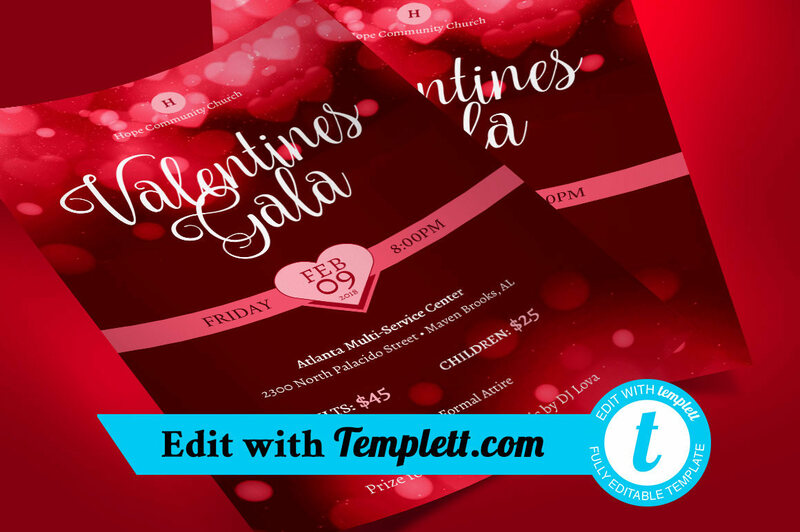 Valentines Gala Ticket Templett is for valentines fundraising events. perfect for churches and non-profit organizations. The red heart background sprinkled with pink makes it perfect for Valentines. 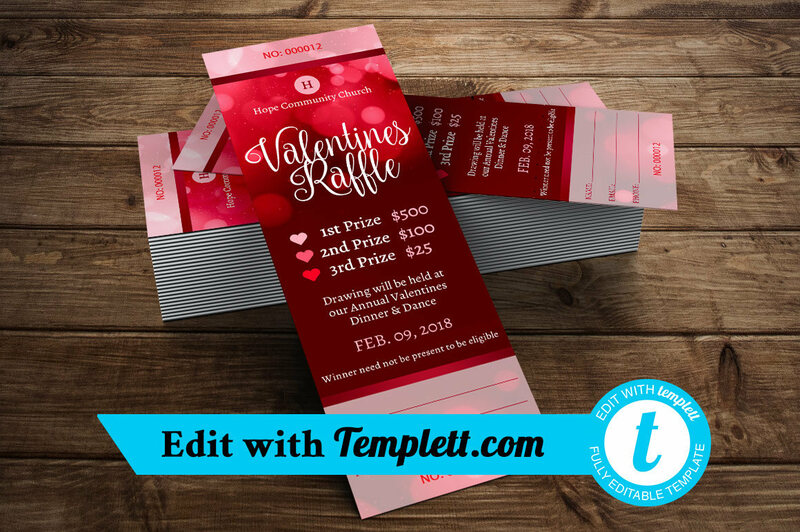 Valentines Raffle Ticket Templett is for valentines fundraising events. perfect for churches and non-profit organizations. The red heart background sprinkled with pink makes it perfect for Valentines. 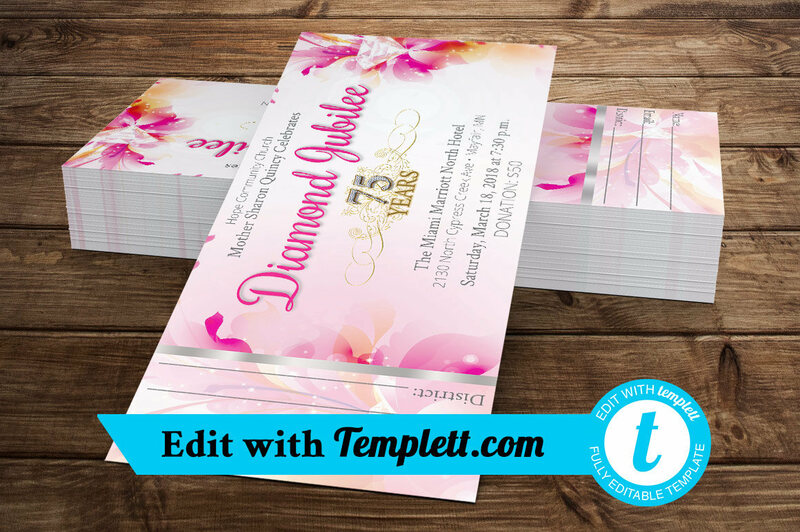 Fuchsia Diamond Jubilee Ticket Templett Template is for any kind of commemorative or anniversary event. The floral design lends itself to other activities like birthdays, luncheons, concerts, Christmas , Valentines and Easter events and more. 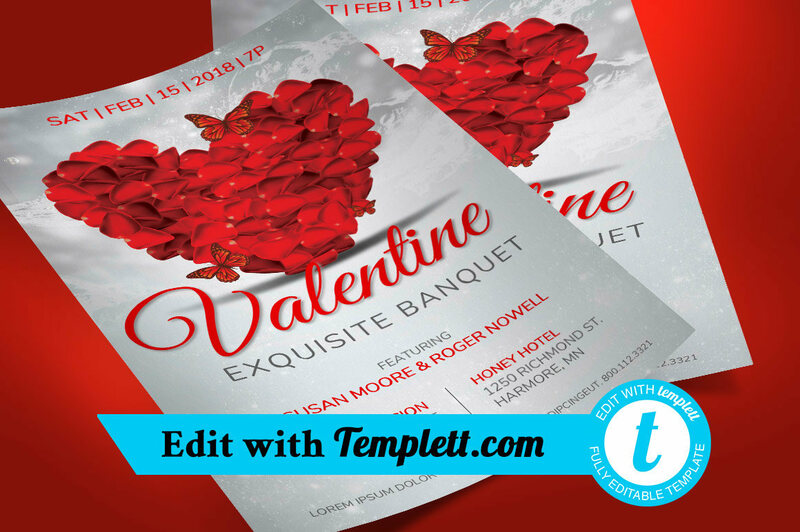 Red Valentines Banquet Flyer Templett is for valentines fundraising events. perfect for churches and non-profit organizations. The redt background with Gold trimings gives a vintage feel to your Valentines. 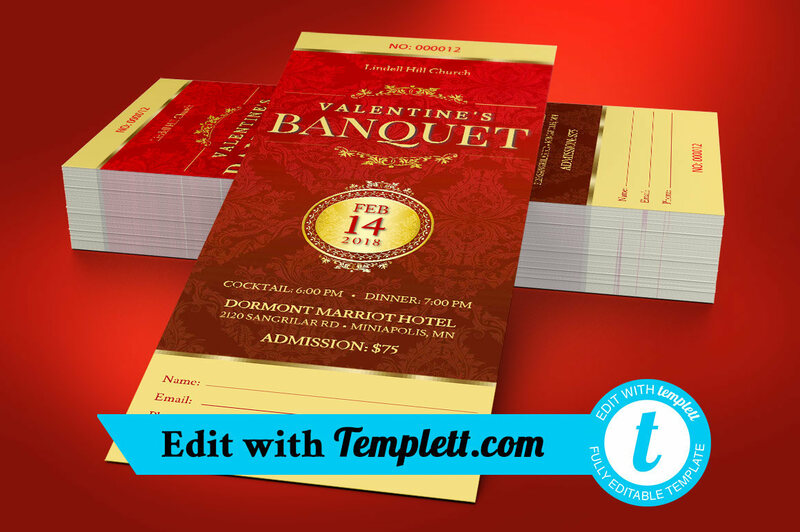 Red Valentines Banquet Ticket Templett is for valentines fundraising events. perfect for churches and non-profit organizations. The redt background with Gold trimings gives a vintage feel to your Valentines. 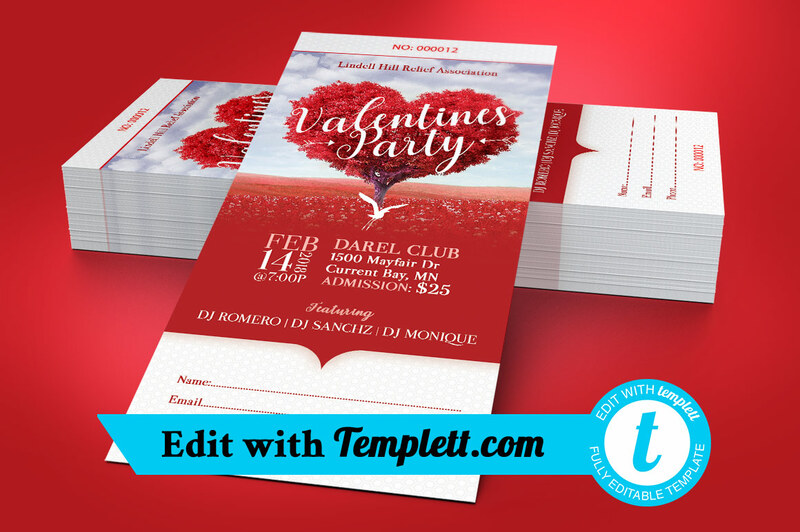 Petals Valentines Banquet Flyer Templett can be used for any party or events that needs a modern appeal. Great for red or white themed parties, Valentines events. Can be used for Club Parties, Birthday Parties, Banquets, Tea Party, and more. 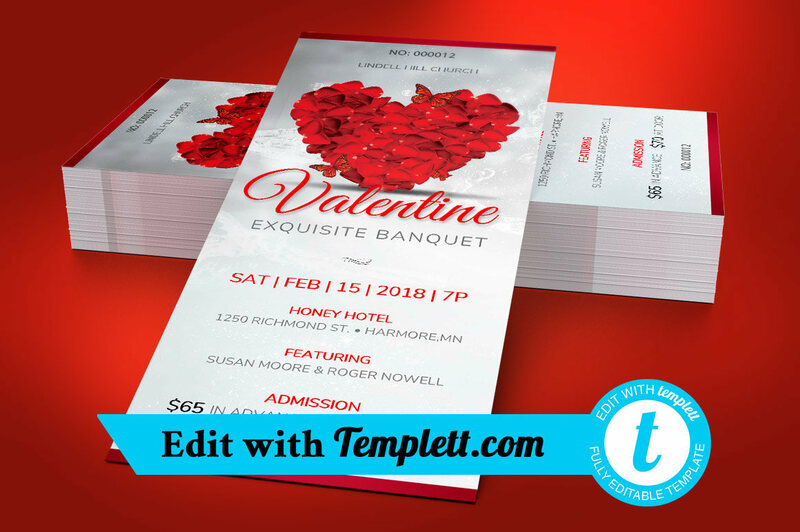 Petals Valentines Banquet Ticket Templett can be used for any party or events that needs a modern appeal. Great for red or white themed parties, Valentines and Christmas events. Can be used for Club Parties, Birthday Parties, Banquets, Tea Party, and more. 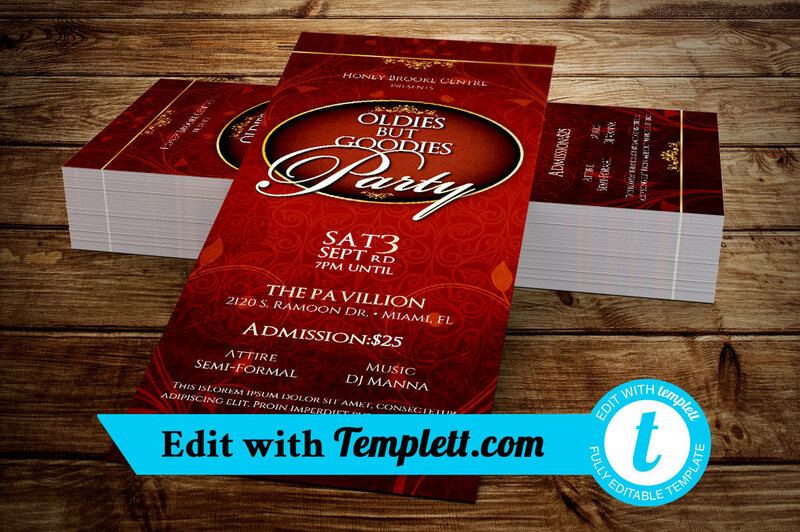 Oldies Goodies Party Flyer Templett can be used for any party or events that needs a vintage appeal. A great invitation for Banquets, Tea Party, Birthday Parties and more. 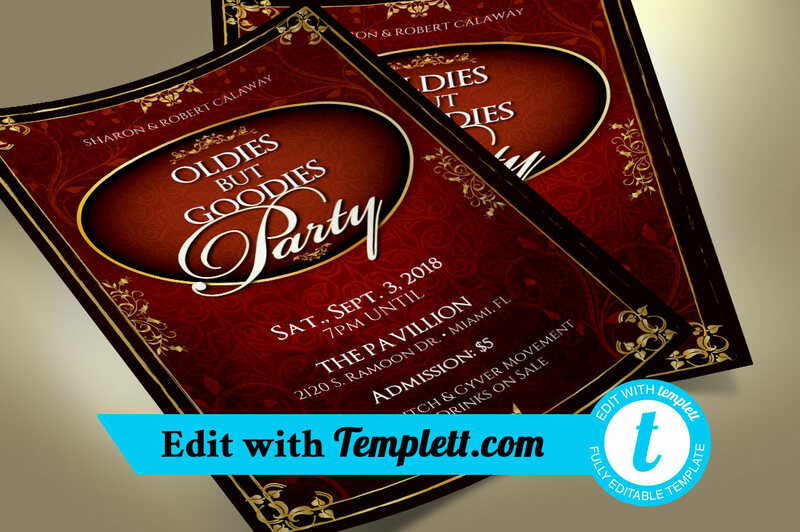 Oldies Goodies Party Ticket Templett can be used for any party or events that needs a vintage appeal. A great invitation for Banquets, Tea Party, Birthday Parties and more. The rustic background with gold decals and gorgeous script text, makes this ticket a must have for your next vintage event.